Christopher has specialised in Real Estate Finance and Secured Lending throughout his career. Christopher joined Capital Law in March 2014 and has taken the Banking and Finance team through a period of sustained growth, gaining new clients and expanding the services we provide to existing clients. The team of six dedicated Banking & Finance lawyers regularly act for banks and funders in the construction sector in both commercial and development finance transactions. Christopher also acts for borrowers when banks have appointed lawyers, and uses his experience to guide borrowers through the due diligence requirements of their chosen funder. Professional opinion on validity of security. Following review, the team has often been instructed to draft the appointment of LPA/Fixed Charge Receivers together with the relevant acknowledgement documentation. Once the receivers have been appointed Chris and his team are often instructed to act in the sale of the relevant property to the ultimate purchaser ensuring the personal liability of the Receivers when acting as agent for the Seller is excluded. Christopher is a committee member of the Wooden Spoon Society – the children’s charity of rugby and a founding member of the Three Counties Welsh Society Networking Club. 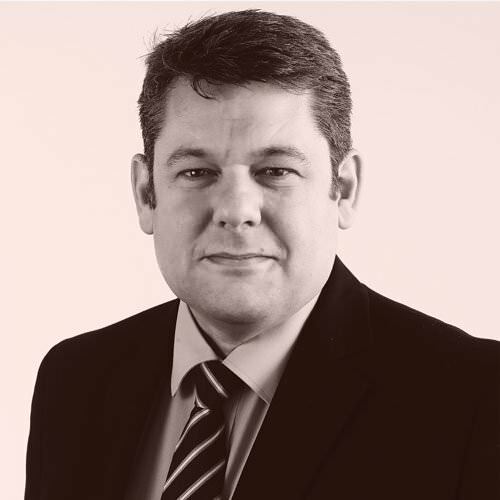 Chris has a wealth of experience and continues to provide an excellent service on all of the corporate banking transactions we have carried out together. Highly recommended. Acting in a £6m revolving credit facility secured against a portfolio of properties and documented in LMA documentation. Syndicated loan for two banks funding a housing association development company using LMA facility documentation and secured against land and contract documentation with the parent company. Acting for a prominent private bank in numerous investment and development projects in South Wales, London and across the UK. Acting for Santander UK plc in numerous transactions in a sole representative capacity, but also in a number of joint instructions with their customers, allowing us to utilise our experience of acting on both sides of such transactions. Acting for the Cardiff branch of Handelsbanken on a loan to a Cardiff based property company with an extensive portfolio of commercially let properties in and around South Wales. Advising a community interest company on the banking elements, on a £7m regeneration project, with funding from Big Lottery, WEFO, the Coastal Communities Fund and a senior lender in due course in relation to all security, facility agreements and priority arrangements. Acting for Barclays Bank plc securing a portfolio of five properties, advising the client on detailed facility agreements and complex security, culminating in the production of a certificate of title for each of the properties two of which were acquired and the remaining three re-financed. In addition to providing numerous security reviews for Banks and funders, Chris and his team have been appointed on several portfolio disposals by receivers across the UK. Acting for the appointed receivers, Chris and his team have been responsible for delivering sales to tight deadlines; managing the liability and limited knowledge aspects of the transactions. Chris and his team are also called upon to provide advice to Banks and funders in respect of borrowers who are in difficulty from Reservation of Rights letters to discussions and strategies concerning enforcement options.